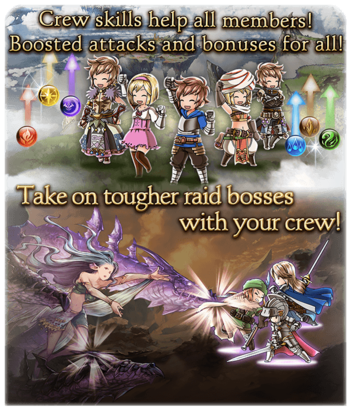 A crew is a group of up to 30 players, which gives them special perks and allows them to battle together in Unite and Fight events. A crew is lead by one captain and first officers. In order to form or join a crew, players must clear Chapter 4 Story - The Storm Guardian . Crew Rank increases depending on total rupies donated to the Crew. Higher Crew Rank increases the maximum crew size up to 30 at rank 10. Purchase Airship ✔ ✔ ? Select Airship ✔ ✘ ? Start with 100% charge bar and a 20% boost to exp and rupies in most raids for one hour two times a day. Strike Times can be set to any hour. Airships provide a base 2% atk bonus to the particular airship element. This can be increased by "tuning" the airship with weapons, leveling it up to level 9 for a 10% boost. Earth, Fire, Wind and Water are the only ones available. The Grandcypher (Wind) is the default airship. Airship parts can be purchased with rupies in the crew bank. Each part grants special Crew Skills, which vary by part. Each part purchased for a given airship is bound to that airship, and can't be transferred over to other airships. Parts can be upgraded up to two times, unlocking stronger and more expensive versions of the Crew Skill. Up to 4 Crew Skills can be activated (3 with less than 20 members). Without discount, activation costs are 2,500 for Lv1 skills, 5,000 for Lv2, 10,000 for Lv3. All Crew skills last 72 hours / 3 days. Unite and Fight are focused on crews competing with each other. For ranking purposes, only honor gained in raids started by a crew member counts. Depending on the crew's performance in the last event and the ranking received, it will gain a discount to the activation costs of crew skills between iterations, up to 70% at SSS rankings. Leaving a crew incurs a 24 hour penalty, preventing the player from joining another crew for the duration. This is done to prevent players from taking advantage of multiple Strike Times. Players cannot leave a crew while a Unite and Fight event is underway. This page was last modified on 5 October 2017, at 18:58.